Did you ever notice how chipotle peppers just LOVE sweet potatoes? 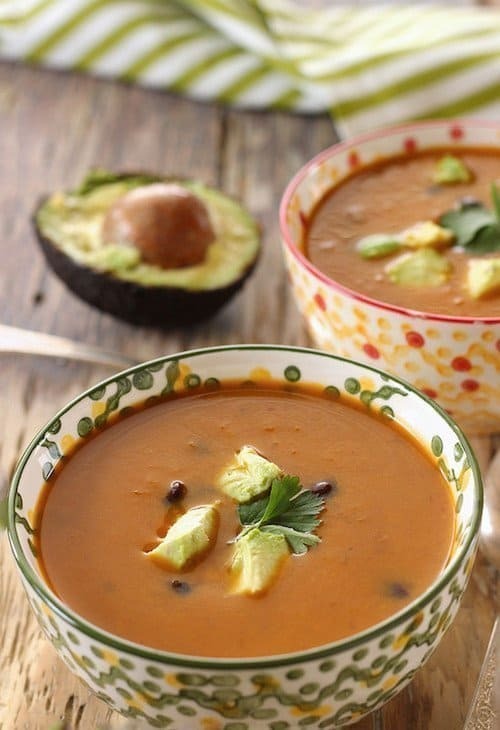 It’s a match made in heaven, and when you throw in black beans and some avocado, you get a delicious, spicy, sweet potato soup that will warm you up all winter long. You might know if you follow this blog that I recently moved to Arizona. I grew up in Chicago, moved to Boston after college, and after a very long time complaining about the cold, and the clouds that seemed to hang around for months at a time, and the 4:15pm sunsets all winter, I packed it up and moved southwest. And I LOVE it! Winter now means 5:30pm sunsets – very do-able, and today is a chilly 63 degrees with just a few puffy clouds. Like I said, LOVE it! Everyone said I’ll miss the colors of fall. Can’t say that’s happened yet – ’cause I love not having to rake. And the first snowfall. Nope, ’cause I know once it starts, it doesn’t end. And grass. Mmm, maybe a little but I can get used to the pool instead. Here’s what I do miss though – soup. Soup is the best part of fall and winter. I used to make a big pot every week starting in early September, and I loved the leftovers and those no-cook nights. It’s finally cool enough here that I started craving soup, and since I had a few sweet potatoes and some chipotle peppers, this is the first one of the season I came up with – Chipotle Sweet Potato and Black Bean Soup. I’ll probably still make a pot of soup each week, but I guess now the season will be short – mid December through February I’m guessing. That’s OK – I can deal with it cause I don’t have to shovel! In a large stock pot, salute onion in oil over high heat, until wilted and started to turn golden. Add vegetable stock and sweet potatoes. Bring stock to a boil, reduce heat, cover and simmer about 20-30 minutes, or until sweet potatoes are tender. Puree the soup with an immersion blender, or in batches in a regular blender. Add black beans, and salt to taste. If desired, garnish with avocado pieces. 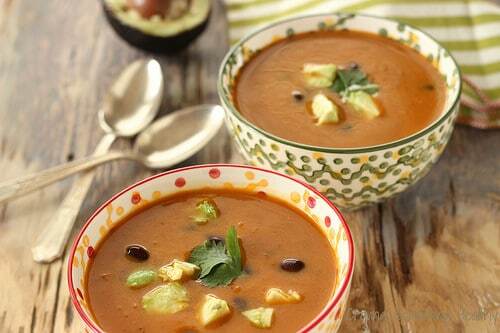 Do you make soups in the winter? What’s your favorite? Previous Post: « Yes – You CAN Have A Lower Carb Thanksgiving! When I’m too lazy to go to the gym, I just rake my leaves, haha! Sounds like fab weather where you are. Here in St Louis, Missouri, it’s just been raining and grey… wish it would just go warm or go cold and snow! This soup looks delicious, maybe I’ll make it once we (hopefully, because I like the snow) go cold. Happy Monday! That’s very true- raking and shoveling do count as great exercise, and cold and gray is the worst kind of weather! Hope you get snow soon! It looks SO yummy!! 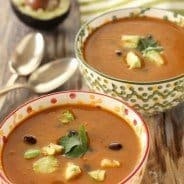 I’ve always wanted to make a black bean soup. And sweet potatoes just go well in everything!! Thanks! I do agree that sweet potatoes are so versatile. Thanks for stopping by Leigha! This looks good, Anne. I have been looking for a soup to accompany our oyster roast. This might be ‘the one’. Thanks for sharing! Hooray! Let me know if he likes it!